Let's just put something out here... I'm a Real Housewives fan! Specifically, I love the Real Housewives of Orange County. Somehow watching all that drama just makes my life seem very calm & normal (sometimes) haha! :) If you keep up with the show, you might know that one of the Housewives, Gretchen Rossi, has her own makeup line! Last week I decided to check out the line on her website. I thought it might be fun (especially for the fellow RHOC fans) to try a few things and do a review! I suppose this is more of a "Face of the Day" at this point, since it's my first time trying the line. I got a blush and lip gloss that I'm not wearing with this look (I'll blog about them later), but for now, I'm showing the eyeshadow palette I got. It's a 5-color palette called Goddess. There were two other versions of this palette- one with golden/neutral tones and one with pink/blue/smokey tones. The cost is $39.99... a little pricey, but most of the other things on the site are pretty reasonably priced ($12.50 for blushes and lip glosses, for example). I was excited to see that the shades in this palette were actually a little deeper than the picture made them seem on the website. The light pink on the far left has some sparkle in it, but the rest are just shimmery/metallic colors. The deeper pink is beautiful, and I love the unique sheen of the purple... I don't know if you can tell by the swatch below, but it has a bit of gold shimmer in it-- very pretty. Then you get a bronzy-brown and sort of a burgundy shade. For my eye look, I first applied my "Put a Lid on It" eye primer from The Balm. Then I used the lightest pink in the inner corner, the deeper pink all over the lid (mixed with some of the purple), and the burgundy color in the outer corner. I also smudged a little bit of the burgundy under the eye. Then I used black liquid liner, mascara on the top and bottom lashes, and used the Kiss 03 false eyelashes. I'm wearing ELF Mineral lipstick in Runway Pink on my lips, topped with MAC Lipglass in Nymphette. I'm also wearing a pink blush from Mally Beauty called Mally's Glow, Revlon Colorstay Whipped Foundation in Warm Golden, and Essence Sun Club Matte bronzer. I took all of the pictures after this makeup had been on for eight hours... I knew my foundation would stay in place, but was really pleased to see that the eyeshadows hadn't budged either! I think this is a really nice palette for a soft, feminine look, and I look forward to experimenting with it and using it in some other ways. 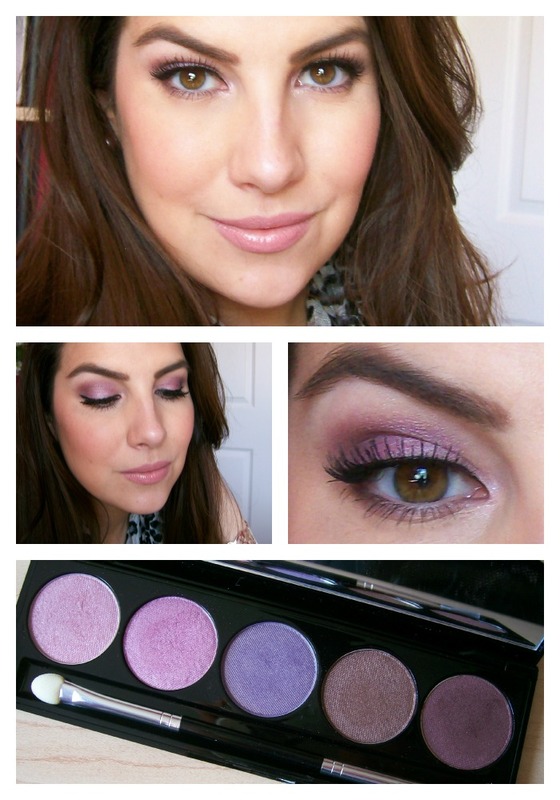 For example, I think a look primarily using the lilac and bronze shades would be super pretty! :) Stay tuned for more posts on the other things I tried from the Gretchen Christine line! New video on Beauty Broadcast just uploaded! Doing some sort of pizza/pasta bake right now... it's smelling good. Tomorrow's blog post will be featured on the Ladies' Home Journal Gloss Daily blog! This makeup look is so beautiful! I love these shades. I'd love to know more about that pizza/past bake!! I love the Real Housewives show! It's entertaining and a nice break from school and work. I love the makeup look! I also watch all the Real Housewives except the New York one, for same reason you watch it, Beverly Hills and Orange County is my favs. I didn't know Gretchen had a makeup line!! excited to know! I love your eyelook! You look gorgeous! :) Great post! I am so glad you tried this line out! I'm seconding Sugared Grapefruits request for more info on your pizza/pasta bake recipe. Loved the look. I'll have to try one similar: I don't have that palette, but seems interesting. You are so lucky to see the robin's nest! I love robins, I love cats, I love make up, I love you, ahahaha. Kisses and thank you Emily! I love your cat, she looks a lot like my cat. They sure love the sun.. I have mixed emotions about this makeup line. While I'm drawn to several of the colors, and I'm Gretchen fan, shortly after the line launched there were allegations regarding the "authenticity" of the line. The allegations indicated "Gretchen Christine Beaute" is a derivative of Lady Burd cosmetics (a contract manufacturing company). On the show, it seemed implied that Gretchen had developed this product independently. However, re-labeling and color/product selection doesn't seem like "product development" to me. The argument could be made it's good marketing, but I tend to feel misled by it. Nevertheless, a good product is a good product. I just feel the price point isn't justified- especially if this line is just repackaging. . . I don't really watch TV, so I don't know who this is. Your makeup look is beautiful, but that makeup is 100% Lady Burd private label. Those prices are outrageous! She's marked up the prices of many of those items by 3 times the cost! Ridiculous. hi are you familiar with ladyburd prices? I love the eye look emily but 40 bucks? No way. All under 40-50 bucks. Like what was the lady thinking? Every woman at some point in her life has had to switch beauticians..
so for those who are looking for the best beautician, I suggest Yani as one of the best!! good install Android APK files on your PC. Bluestacks does it Google Play Store for PC System Google play permits android users to download and nice. your make up is lavish and you look so beautiful and adorable.